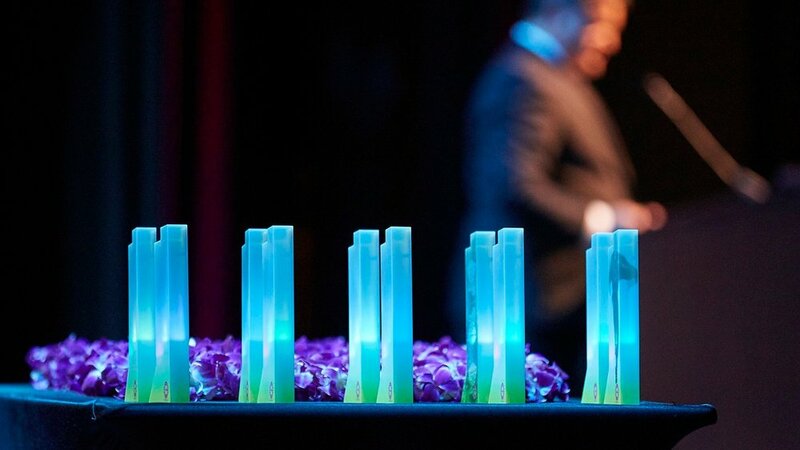 For the seventh year in a row, FATHOM sponsored the design and production of trophies for the East Bay EDA’s Innovation Awards Ceremony on March 28 (Economic Development Alliance). FATHOM’s engineering and design team created this year’s award using one of its in-house PolyJet-based 3D printers—the bright and colorful design pays homage to the 90’s because two of the local award winners were MC Hammer and Tower of Power. In this blog post, learn more from Industrial Designer Ava DeCapri. The FATHOM team has reimagined this award design throughout the years using different software, technologies, materials, and techniques (view 2018 design blog post). Sponsoring the production of these trophies not only honors the innovative work taking place in the local region, but it also demonstrates a variety of additive manufacturing approaches for industrial prototyping and production part applications. From multi-material to lattice structures and much more, FATHOM designers and engineers love to get creative for this great organization and their efforts to highlight the many innovators pushing the limits in their respective industries. This year, the engineering and design team wanted to highlight the vibrant colors of EDA’s 2019 theme. 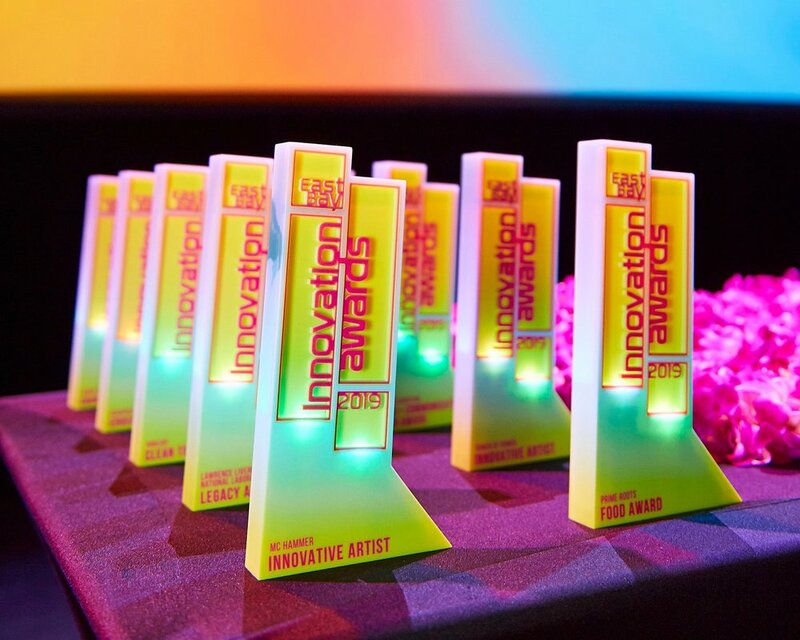 Industrial designer, Ava DeCapri utilized a similar technique to the peer-to-peer FATHOM trophies from earlier this year and was able to create a part that went from opaque to translucent in a gradient using theme colors. 3D printing VRML files with full-color graphics mapped to the surface of the part were managed using the advanced slicer add-in for one of FATHOM's J750 PolyJet-based 3D printers. For two of the awards, digital graphics of the musical artists were generated in Adobe Illustrator. Then, the meshed part was brought into Photoshop where the surface of the part was unwrapped to create a flattened, or 2D, version of the 3D part. From there, graphics were applied to the 2D unwrapped map (this informs where the graphics will be placed on the 3D version). "In this method of unwrapping, applying graphics, and rewrapping the graphics back on to the part, we can achieve seamless graphic artwork on the surface of a 3D body that would otherwise be difficult to produce," said DeCapri. Taking it a step further to highlight the material translucency, LED electronics was embedded in the base of the trophy to illuminate from within (there is a hidden compartment at the base to access and replace the batteries). Congratulations to this year’s winners—click thru to view the awardees! To learn more about East Bay EDA, visit iawards.eastbayeda.org/impact. Did you know FATHOM’s application engineering team offers a course on how to design for additive manufacturing? Check out the FATHOM calendar of events for upcoming sessions. For more information about FATHOM's engineers and designers who can be contracted to support your in-house design team's product development, click thru to read about their expertise and view available services.